To push the boundaries of e-science closer to realistic applications, and to improve our understanding of chemical and physical phenomena, development of methods and models at all levels is needed. Not least, we must find ways to combine methods in a powerful yet feasible way, and learn how to smoothly move up and down the multiscale ladder. 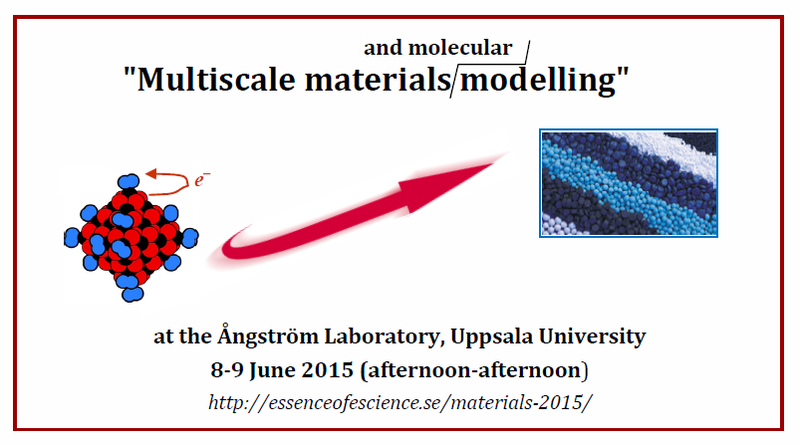 The national e-science programme eSSENCE – where Uppsala University, Lund University and Umeå University are partners – now welcomes you to discuss methods/models and modelling applications at this fourth national meeting on multiscale materials modelling. We use the word “materials” in a broad sense, including molecules, liquids and interfaces, and even fish. David Sumpter (UU) “The principles of collective fish behaviour – are there similarities to molecular dynamics? Additional information (transportation, maps, etc.) concerning Uppsala and the meeting can be found here. We hope you want to participate and contribute with your scientific input !